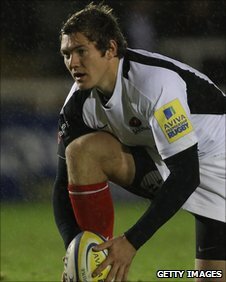 Saracens kept up their pursuit of Leicester at the top of the Premiership table with victory at Exeter. Chris Wyles' try added to Alex Goode's two penalties as Saracens opened up an early lead but Jason Shoemark crossed over to make it 13-5 at the break. Exeter's consolation try arrived in injury time through Sireli Naqelevuk. Saracens sealed their seventh successive Premiership victory and did it in style, subjecting the hosts to their heaviest league defeat of the season. The Chiefs started brighter but conceded a penalty after 15 minutes for not releasing the ball and Goode, playing at full-back, kicked to open their account. Sarries maintained the pressure and Chiefs gave away another penalty, again in front of the posts, for offside and Goode slotted his second kick. Midway through the first half, Shoemark had his kick charged down and Brad Barritt collected the loose ball to put his centre partner Wyles through for the first try of the game which Goode duly converted. Shortly before the break, Luke Arscott picked up a poor pass off his toes and managed to get the ball away to Shoemark to cross for his first try for Exeter, but Gareth Steenson was unable to convert. Saracens were awarded a 35-metre penalty after the restart and Goode extended the visitors lead with his third penalty. But when scrum-half Richard Wigglesworth took over the kicking duties from Goode, he missed with his touchline penalty attempt. With just 14 minutes of the game remaining fly-half Farrell landed a 30-metre kick before replacement wing Cato forced his way over the line with Goode converting from out wide. Sarries powered over again through Gill and Goode converted his third. But Exeter kept pressing for another score and centre Naqelevuki went over in the right corner and Ignacio Mieres added the extras. "We have been taught a bit of a lesson by a team that are in good form. "We made a lot of promises to ourselves during this season about enjoying the experience of the Premiership. "But, the truth is, I think that we haven't really enjoyed the past two or three weeks because, for whatever reason, we are not playing right to the edge that we can do and we have just lost that a little." "It was a very good because we know that before this game Exeter have only lost three home league games, so for us to get any sort of win was great. "There were periods of time when we were certainly on the back foot, especially the first 10 minutes of the second half when the game was in the balance with us 13-5 in front but we defended brilliantly during that time. "We soaked up the pressure and every time we got in their half we came away with some points and that was key. "I think that we left a couple of tries out there but overall we are pleased with the result." Exeter: Arscott; Jess, Shoemark, Naqelevuki, Sestaret; Steenson, Poluleuligaga; Sturgess, Clark, Tui; Hayes (capt), Hanks, Johnson, Scaysbrook, Baxter. Replacements: Whitehead, Moon, Budgen, Slade, Phillips, Cowley, Dollman, Mieres. Saracens: Goode; Strettle, Wyles, Barritt, Short; Farrell, Wigglesworth; Stevens, Brits, Nieto; Botha, Smith; Brown, Burger, Joubert (capt). Replacements: George, Gill, Du Plessis, Vyvyan, Saull, Barrett, Powell, cato.